Transom windows are one of those window options that do not typically stand alone, but that can add a dramatic look and feel when combined with other windows or doors. Transom windows are placed above a window or door to let in more light, and in some cases, to let in more air. Transoms are rectangular windows that are placed over a doorway or another set of windows, adding additional light and architectural detail. They can also be other shapes as well, such as semi-circles or fan shapes, to add even more dimension to an existing window or door. You can install either new construction (often installed in conjunction with a new door) or replacements to update the look or to create more energy efficient options. The cost of transom windows can vary substantially depending on the size, shape and other decorative and energy efficient features. As a general ballpark, however, you can expect to pay in the neighborhood of $150 to $275 or more for the window itself. Installation cost will run $100 to $250 per hole depending on whether you are installing replacements or new construction. Transoms add more natural light into a home and provide enhanced architectural detail. They “open up” an entryway and offer an eye-catching design. When added on top of double or single hungs, for example, they can also add drama and light in a room, creating additional height, making the ceilings look higher and creating an interesting focal point. Some of them can be opened (they are hinged on the bottom and tilt-in from the top), adding additional ventilation as well. Since most transom windows are stationary and do not open, there are no moving parts to wear out or break. This makes the windows a very durable option. Also, since they are installed high up on a wall, they do not endure the day to day wear and tear that other windows may encounter because they are lower down. This makes them very durable and long-lasting window options, but of course durability will depend in part on the installation. Transoms come in a variety of shapes and sizes, with the most popular being long, wide rectangles or a semi-circle shape. They can be made from a variety of different frame materials, such as a href=”http://www.replacementwindowsconnect.com/materials/wood-windows/”>wood, a href=”http://www.replacementwindowsconnect.com/materials/aluminum-windows/”>aluminum or vinyl windows. They can have many of the same energy efficient features incorporated into them as other types of windows (such as multiple panes, gas fills and energy efficient coatings). They can also be made with various types of decorative glass for added aesthetic appeal. Transoms can be stationary or can be ordered with hinges to open and close. 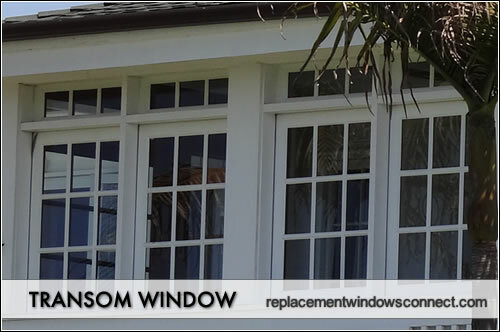 Both new construction and replacement transom windows are available, depending on your needs.